I totally missed it. I blame brain fog for that. But I had a blogiversary this month. 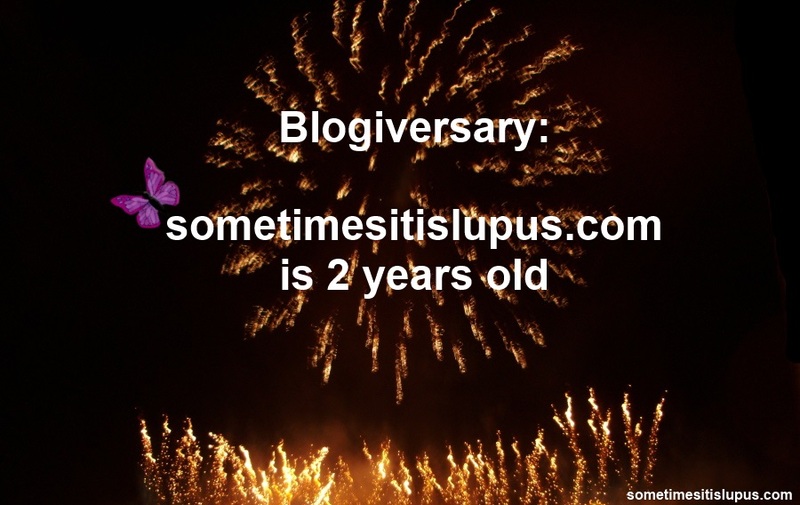 As of the 16th of May, sometimesitislupus.com is two years old. There are times when it feels as if this site has been part of my life forever, and times when it seems like I only started out yesterday. 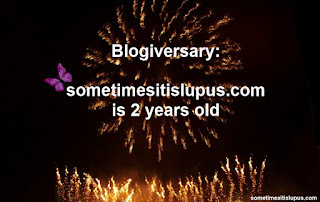 For all those lovely lupies, and supporters, who have been part of Sometimes, it is Lupus in any way over these two years, through reading and commenting on the blog, or being part of the community on Facebook or Google+, sharing on the Warriors' Wall, or the Business Directory, thank you. It's been a great privilege to share these last two years (or parts of the last two years) with you. You're welcome ! You do a great job to raise lupus awareness with your blog and every information you're sharing. Congratulations! I enjoy reading your blog, and have learned many things about Lupus from you. Here's to many more blogiversaries!